LEASE, SELL TOP END PROPERTIES, FACTORIES, SPECIALIZING IN COMMERCIAL PROPERTIES TO RESORTS; HIGH END HOMES & LAND PLUS FACTORIES & CAN SOLVE YOUR PROBLEMS IF YOU BUY YOURSELF USING OUR LAW SERVICES. NO HIDDEN COSTS TOTAL DISCRETION WITH OUR FOREIGN PARTNERS. IN BUSINESS OVER 30 YEARS. We put you on to the sellers. We do the law work via our Law Office. - a company can purchase land and buildings but will be inspected and all Thai shareholders veted. - more than 49% of a condominium unless in Company form. - if you invest 40m baht you can buy 1 Rai of land in Thailand outright. We receive our commissions off the seller or landlord and no added charges are imposed on you the buyer or renter. What we make sure is you get a professional service with no hidden costs, plus we help you with your lease agreements and oversee everything you need. You may have a Thai friend who says they can get you a better deal. Unbeknown to you they may be getting a commission or even 2 plus a scheme --can you read Thai??. Using our services we guarantee that the lease and selling documents are in order as we have our own Barrister at Law. Please do not ask us for mortgages as we cannot help unless you are married to a Thai or own a Thai Company. Thailand has so many different types of properties for sale that whatever your dream home is, you can realize it here if you do the paperwork right. Prices are a lot cheaper than Western houses but some aspects need close scrutiny especially wiring, water & most importantly the deed title. Now that you want to buy a house what should you look for? The first thing you need to do is obtain the services of a reputable real estate agent or lawyer on your behalf. The Thailand Realty Industry is not regulated so watch out for agents forcing you to sign contracts, & check the title deed to make sure the property is what it says. Do yourself a big favour and obtain a House Inspection report which in effect pulls the holes out of the property! Some buyers have bought the house only to find the land is on a different title & visa versa or the cracks have been disguised. Once you buy then its your problem. Many Estates will try to sell a house in a developing block which has but one title with say 10-20 houses on it. They probably have 2 mortgages and want to unload the houses before they pay off the loan & secure the titles for their owners. Or will they?? ?--- we had a case & saved the foreign buyer 2.8m baht that he would have lost if he did not use our service. The same goes with the boundaries of the property which need to be the same as the title deed. In Thailand there's no survey pegs as such but they do use concrete pegs & it is an important point. Sometimes vendors deliberately understate property area or move so called pegs. If the building is under construction or the land is having a subdivision look carefully at the provisions for issuing a title, and easement rights for say roadways. if you are a foreigner you can lease for 30 years or form a company to hold the house. Remember also do not start a company for the sake of securing your house. If you do not carry out business and do not have employees ( and I mean NO nominees that your law firm has provided) you will find yourself in hot water. Sor Kor 1 This document means that land occupants are occupying or making use of certain land plots, whose ownership has not been claimed by any entity. The document does not indicate legal possession of the informer so one cannot transfer the ownership of the property to any one else. The Sor Kor 1 is rare now as the government's land ownership legislation has covered most area of the country. Nor Sor 2 states the government's permission for person or legal entity to make use of land temporarily. Need to utilize at least three-quarters of the land plot within three years after the document issuance. This right is non transferable. At the finish, land occupants can seek the right to demand higher privileged title deed. Nor Sor 3 is a governmental letter certifying a utilization of certain land plot by certain people and that the plot of land has been surveyed and its official map created. Nor Sor 3 A is similar to the Nor Sor 3 certification. The only difference is the map survey of the land plot based on an aerial-viewed photograph of the land. Ownership Title Deed or chanote is the ultimate certification of land ownership. Holders of the title deed have full rights to transfer or sell the properties and to bar other parties from violating their rights over the land protected by the ownership title deed law. 1/. A builder 2/. A broker 3/. a worker/builder. Those who have been caught out are using (2) which could be a friend who procures a builder for the foreigner then has a separate contract with the builder for his cut which is 1/2 of the asking price. Thus you are giving money away & in fact are being ripped off as inevitably the actual builder will never be able to meet his deadlines. Plans & fees etc should not be more than 50,000 baht yet we have seen charges of 400,000 baht. The fees for 1 sq metre is 1/2 a satang which is not even a baht. 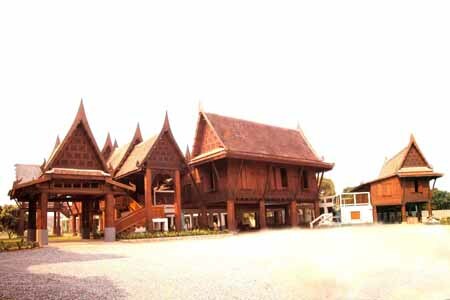 If you need a good builder in Chiangmai and architect refer to your architect for the prices. You also need to have a builder who can complete an average house in 3-4 months & check his equipment and formwork supplies, how many workers he/she has & work he/she has carried out. Talk to the referrals & your architect to see if they keep to their word. Remember also Thai holidays workers will stop work on buddhist holidays and funerals etc. Make sure the contract is overseen by a lawyer or ask us as we can give you a quote with times etc if you want us to do. Tel (00-66)019527812. We have seen single storey houses charged at 6.8m baht when the price should have been 1/2 this. Just remember having a Thai friend doesn't necessarily mean they are a builder---they are only getting a commission --when it comes to progress payments and they ask in advance you could find yourself in a bad situation. Itemize the materials and also how many men they will have on the job and also if building multi-stories, their deadlines and time limits. Prices per sq metre to build are approx: 8-12,000 baht or more as labour is expensive in 2018. But, remember this will vary according to the extras and items like marble and appliances etc. All developers in Thailand can and will offer you discounts and extras just to get your business. If youre not happy with some detail ask to change or add on to. Compare what they might offer you with what you would like. Look for Special home loan packages, Extra loan rate -- nowadays, local banks offer home buyers rates that are even below their minimum lending rates (MLR), Discount on land price, Gift voucher, extra room etc & ground maintenance. Have everything in writing. If the phone doesn't work and they say it will be installed next week or month don't believe a word same with the water, gas lines if any etc. Do not pay a booking fee as then you are locked in. Never put deposit down until your lawyer has searched the title out. FORMING A THAI COMPANY Some people will say this is the best idea for a foreigner to hold a house in ones name. However with a Thai company yes you can hold a property within the structure of the company. However be warned that if your books show nil profit after 3 years then you may be asked especially by immigration & the Commercial Reg via the tax dept why?? This may affect your visa and the status of your company after that period so be warned if you are told its easy to do. It is, however its also easy for the Commercial Registration Dept to fine you if you are not in profit mode or even take the property from you??? Wait and see. There are no laws governing the real estate procedures so if you buy or put down a booking fee be aware you do this knowing the deal may not go as planned. Getting your money back is a drawn out process that will go on and on. Real Estate is not a closed business nor does one need to register so you the buyer must beware when you purchase in Thailand caveat emptor prevails.. Some buyers have seen pictures on the net then sent a booking or deposit fee to the Realty company --- then seen the property hasn't even been built. Do you think any of them get their money back--the answer is NO. Do your homework first. Some developers offer a buy back, or the guaranteed prices rise when selling or a guaranteed rental figure per month for your property but again take all this with a grain of salt. Who can guarantee rentals in Thailand; who can guarantee you will double your money when selling so when you see this BEWARE --- noone can and certainly not a realty company whose one aim is to make profits so be warned? In such cases you may like to get your lawyer to check on the Property Developer???. You will notice in thailand there are many developments that are incomplete -- a trend in Thai development. Many of these are underfinanced and they run on the assumption that many is better than a few. This year alone steel prices have risen 5 fold; concrete also has increased but the developers lack the foresight to consolidate their building work so instead of building one unit to finish the build 20 unfinished. The developers sales reps are now hard pressed to sell these properties so it is impotant to view what you see and even have copy of the chanote (Title) checked by your lawyer before any monies change hands. We had a case where a well respected Housing development sold a unit to an foreigner before checking the title. Lucky for him we managed to change but the when we checked the title the developer was building 15 units on 1 title --- and saying the titles will be issued in 1 year. In cases like this its easy to say NO THANKS. A very good Lawyers meassage: if an owner says the power transformer will be in next month; or the phone line is going in 1 week after settlement; or the road is being repaved over in 2 weeks --- DON'T BELIEVE IT & ACT WITH CAUTION. If sending over funds to purchase a house you must tell the National Bank what you are using this money for with sums exceeding 2,000,000 baht quantities. If remitting funds from abroad to purchase property which is the law over sums of 2m baht It may save you a headache when it comes to a divorce situation of whose funds were used to purchase the property. If you wish to know more than ask us. Money to buy must be from abroad and no sums under $US5000 accepted and name of buyer must be same as funds remittance. Whether it is buying, selling, renting or leasing all kinds of properties, businesses, land and condominiums right to Commercial properties, we have something for you including our own Thai lawyer.offer full law services from ChiangMai to Bangkok to Phuket.